Family, friends and colleagues of embassy bombing victim Prabhi Guptara Kavaler celebrated her life during a memorial service in McLean yesterday, and reflected on how she, in a twist of fate, wound up saving her husband. Prabhi and Howard Kavaler, both Foreign Service officers stationed in the U.S. Embassy in Nairobi, were working in the building on August 7, 1998 the day it was destroyed by a terrorist bomb. Prabhi Kavaler nudged her husband into leaving his office that day to go to the embassy's community liaison office to get information about schools for their two daughters. He got up from his computer and left the e-mail message he was writing. She stayed inside and, minutes later, was killed in the explosion. "That is the reason that Howard is alive today," said Robert B. Nolan, executive director of the State Department's Bureau of Inter-American Affairs in Washington, where Prabhi Kavaler worked before leaving in July for Kenya. "We know you're in a better place," Nolan said through tears while addressing mourners gathered at the memorial service at McLean Bible Church. "We miss you; we love you and God bless you." Kavaler, 45, was honored yesterday in an interfaith service organized by her brothers, mother and other relatives that featured Christian, Jewish and Muslim prayers. She was born in India to a Christian mother and a Hindu father who converted to Christianity, her family said. She was raised a Christian, married a Jew, became a naturalized U.S. citizen and was raising her daughters as Jews. The service, said one mourner, "really reflected her love for her people, her faith and her passion." Prabhi Kavaler attended McLean Bible Church occasionally, church officials said, when she lived with her family in McLean between assignments. But she, her husband and their two daughters, Tara, 10, and Maya, 5, were members of Temple Rodef Shalom in Falls Church, said Rabbi Amy Schwartzman. A memorial service at the temple will be held after burial arrangements are settled, Schwartzman said. Yesterday, President Clinton granted waivers to allow the burials of Kavaler, Consul General Julian Bartley and his son, Julian Bartley Jr., at Arlington National Cemetery. Neither Howard Kavaler, whom colleagues and relatives described as devastated by his wife's death, nor their two daughters attended yesterday's service. They and his parents, who live in Florida, and members of the Guptara family attended the service at Andrews Air Force base Thursday upon the arrival of the caskets carrying 10 of the 12 Americans killed in the bombing. Attempts to reach Howard Kavaler yesterday were unsuccessful. Prabhi Kavaler met her husband in New Delhi 20 years ago when he was assigned there on his first State Department tour. They married in London on July 7, 1982, said her brother, Prabhu Guptara, and she subsequently became a U.S. citizen. She went from consular wife to consular officer in 1990, after completing the State Department's nine-week course. Classmate and colleague Nina Fite, who spoke at the service, said she was a natural leader. The class would get lectures from various Foreign Service officers, and then Kavaler, who already had been to several posts with her husband, would tell her colleagues "how it really works," Fite said. "She was our reality check. She had a great sense of humor and a spark," Fite said. "We will miss [her] and we love Prabhi very much." The Kavalers had arrived in Nairobi in late July and been at their jobs for about a week before the bombing. Together, they also had lived and worked in Israel, Pakistan, the Philippines, France, the United States, and Kenya once before. Kavaler had an innate ability to relate to foreigners and a gift for languages, said Mary Ryan, assistant secretary of state for consular affairs. "She was a beautiful, beautiful person," Ryan said. "We are greatly diminished by her loss and this tragedy." It's been almost a year since a terrorist bomb ripped through the U.S. Embassy in Nairobi, but Howard Kavaler still feels the pain of losing his wife Prabhi as if it were yesterday. "Time will take the rough edges off the pain and hurt, but the pain and hurt will always be there," he said. 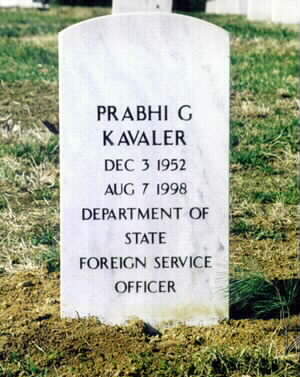 During an April 30, 1999 ceremony at the Fairfax County Library in McLean, Virginia, Mr. Kavaler joined friends, neighbors and colleagues from throughout the Department to remember his wife as a dreamer who loved the Foreign Service and the friendships and adventure it offered her and her family. Mr. Kavaler and his two daughters, Tara and Maya, honored Prabhi's memory and her love of reading, particularly English literature, by planting four cherry trees at their neighborhood library. "Just as Prabhi always attempted to reach for the stars," Mr. Kavaler said at the dedication of the trees and unveiling of a memorial plaque during a glorious spring day, "so, too, these trees will grow and reach for the sky." The Kavalers had arrived in Kenya less than three weeks before the U.S. Embassies in both Nairobi and Dar es Salaam were bombed last August 7. Mr. Kavaler, Nairobi's new U.S. permanent representative to the U.N. Environment Program, had stopped by his wife's office in the administrative section to discuss their new car's delivery. At that time, Ms. Kavaler had asked her husband to swing by the Community Liaison Office to pick up information about schooling for the children. It was 10:15 a.m.--exactly 22 minutes before the bombing--when Mr. Kavaler saw his wife for the last time. He stopped by his own office to save a computer document he'd been working on, then headed for the CLO at the front of the chancery. While there, Mr. Kavaler heard a loud sound, followed about 10 seconds later by what he called "the loudest sound I've ever heard." The ceiling above him started to collapse and his whole world suddenly went dark. He made his way out of the embassy in hopes of joining his wife, crawling through darkness and debris looking for her, without success. The next day he received the dreaded official notification of what he already knew deep down inside. Mr. Kavaler said he still lives with the darkness, and that it will never completely go away. "This is something I will carry with me the rest of my life," he said. Now living in the McLean home the Kavalers bought in 1992 and raising his daughters alone, Mr. Kavaler said he continues to struggle to accept the sudden loss of his wife of 16 years. "It would have been hard enough if she had died a natural death or in a car accident," he said. "But this was pure evil. And it's still hard to accept that someone could do this." Mr. Kavaler said he still feels anger toward the bombers, but he strives to keep as upbeat and optimistic as possible for his daughters. "There's nothing to be gained by my becoming embittered," he said. "If I give up and become embittered, I become the bombers' 13th American victim. I just can't let myself do that, for the sake of my girls." He admitted that he struggles with twinges of guilt, too--that he survived the bombing with only a few scratches and a torn suit, and his wife didn't. "In a sense," he said, "it would have been easier for the kids if she had survived and I hadn't." It took a full two months after the bombing before Mr. Kavaler could even look at a picture of his wife, but his daughters serve as constant reminders. Eleven-year-old Tara looks like her mother, Mr. Kavaler said, and 6-year-old Maya possesses Prabhi's unique brand of mischievousness and charm. Mr. Kavaler and his daughters continue to undergo grief counseling, and he said, "it's done wonders" to help them begin to heal. "I've told the kids that it's okay to cry," he said. "You can't bottle up your emotions inside." Meanwhile, Mr. Kavaler said, he's trying to give his daughters the most stable environment possible. The Department has been very supportive, he said, allowing him to report to work as an attorney in the Bureau of Consular Affairs' Office of Overseas Citizens Services at 6 a.m. so he can be home when his daughters finish school each day. Evenings are spent ferrying the girls between after-school activities and doing homework, and the family makes a weekly trip to the library, where four newly planted cherry trees honor Prabhi. Mr. Kavaler tries to make time each day to swim laps, exercising his body while giving himself time alone to think about the past as well as the future. Mr. Kavaler said his priorities have shifted greatly since the bombing. He doesn't get upset anymore by what he calls "the little things"--when he's stuck in traffic or a few minutes late for a meeting. In the whole scheme of things, he's come to realize, it really isn't all that important. He's even changed his attitude toward his work. "You need to do your best and take pride in what you do," he said. "But a lot of people don't seem to realize that some things should be accorded an even higher priority than working for the State Department." What's most important, he said, is family. Mr. Kavaler said he works to keep his wife's memory alive for his daughters. He regularly shows them photographs of their mother and shares stories about the happy times they shared during postings in Islamabad, Manila, Paris, Jerusalem and even Nairobi. The Kavalers had served together in Nairobi from 1990 to 1992, and it was one of their favorite posts. Tara had enjoyed "a whale of a time" exploring Kenya and viewing the wildlife there, and the Kavalers had been excited about returning to Nairobi and giving Maya the same experiences. Repeating stories about the past is painful, Mr. Kavaler said, but it helps him remember the qualities he loved in his wife: her smile, her beauty, her intellectual sharpness and her ability to work with people to get things done. Mr. Kavaler places flowers on his wife's grave at Arlington National Cemetery every month on the anniversary of the bombing. The grave site, on a wooded hillside, offers a clear view of the State Department's diplomatic entrance. Prabhi's last assignment at Main State was in the Bureau of Western Hemispheric Affairs' Office of Mexican Affairs, which overlooks the diplomatic entrance. As fitting as the grave's location may be, it's also a poignant reminder to Mr. Kavaler of the risks members of the Foreign Service face serving the United States overseas. He remembers the irony of the mandatory security briefing he and his wife received just three days before the embassy bombing. Mr. Kavaler had posed a fateful question: What happens if the embassy is confronted with an incident like the one at Khobar Towers in Dhahran, Saudi Arabia, that took the lives of 19 U.S. airmen in 1996? Sensing the assistant regional security officer's discomfort with the question that everyone secretly knew the answer to, Prabhi had kicked her husband under the table to quiet him. "She was the consummate diplomat," he recalled. Less than 72 hours later, she was dead. Mr. Kavaler was left with still more questions about security for members of the Foreign Service overseas. He expressed concern that the issue--so much in the forefront immediately after the bombings--will fade from the Department's collective memory. "My wife's name will be just another name on the memorial plaque [at Main State's diplomatic entrance]," he said. "People forget." Mr. Kavaler urges the U.S. government to stand by its word to protect its employees overseas. "Members of the military are armed and trained to protect themselves. Diplomats are not," he said. "It's unconscionable for us to send people out into harm's way without the adequate security." In a recent letter to President Clinton, whom Mr. Kavaler met at Andrews Air Force Base when his wife's body was returned to the United States, he urged the President to heed the advice of the Crowe accountability review boards and spend the money required to improve security at U.S. Embassies worldwide. He said the President's "less than robust" budget request for embassy security "simply invites more Nairobis and Dar es Salaams, as well as more ceremonies at Andrews." That--and the pain and suffering it would impose on other Foreign Service families--is something Mr. Kavaler said he owes to his wife's memory never to let happen.